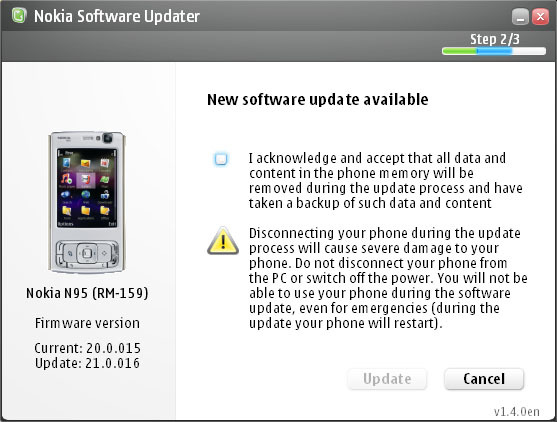 This morning, Nokia released another firmware update for the trusty N95-1 on the NSU. It’s brought it up now to v21.0.016. The updates in this one include extended battery life, Flash 3 lite built into the browser (so youtube and iplayer will work), support for standalone widgets, more stable bluetooth connections, faster gallery, and faster Java support, to name but a few. I’m just updating my phone now so I’ll let you guys know how it goes. The All About Symbian website has more details on the update. 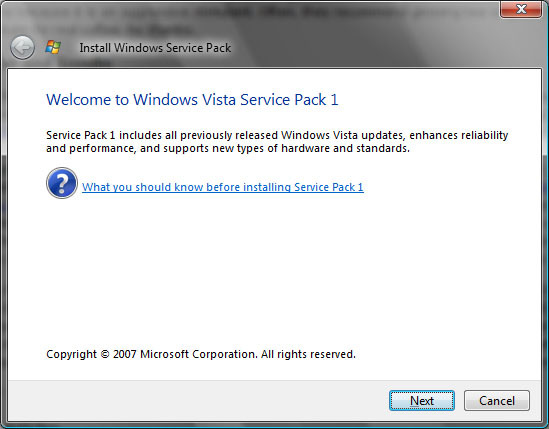 Vista SP1 – About Bloody Time! Microsoft have now released their first Service Pack for Windows Vista to the public. I just did an update for Defender and my sound card drivers, then it showed it as available. I’m downloading it right now. Yup, just come back from Birmingham after having an inverview there. After reading all of my FHM, playing Hot Pxl for an hour and listening to music all the way back home on the coach, I’m ready to hit they hay. I managed to take some time to take a browse around the Bullring, a (or perhaps THE) shopping centre in Birmingham. I had a Starbucks, I bought Hot Pxl (see above) and I had a go at GT5 Prologue on the PS3 in a CurrysDigital shop. Peeps were asked to compete to see who could get the fastest time. I got 2’25.472 in total for my time round the London track, and I was .009 seconds behind the leader! Darn! Still, silver ain’t bad and, being realistic, if I could waltz in and get that close to the top then in all likelyhood someone else could too. I didn’t walk away empty handed though. I got a free PS2 t-shirt and GT keyring along with a couple of brochures so that’s not bad. Oh yeah, no weighing today because I’m knackered. I’m officially out of Garlands! Yup, just got home now from my last day at Garlands! I’ve been there for almost 3 1/2 years and worked in a couple of different departments and now I have my degree it’s best I move on. I would’ve left sooner if it weren’t for the friends I’d made while I was there. 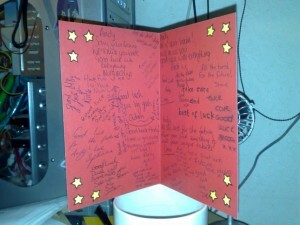 They even got me a card!! My thanks go to the Outbound Collections crew and those who were in Tech Support. 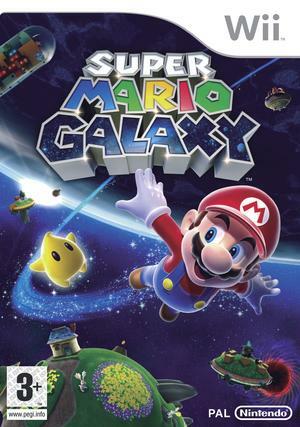 I couldn’t be arsed for ages, but I finally managed to get round to collecting all 242 stars in Super Mario Galaxy. I’d gotten to about 80 ages ago with Luigi but couldn’t be pestered, but tonight I fancied playing it so got the remaining 42. To be honest, as pretty as the final ending was, I was a little disappointed. Nintendo could’ve done more. 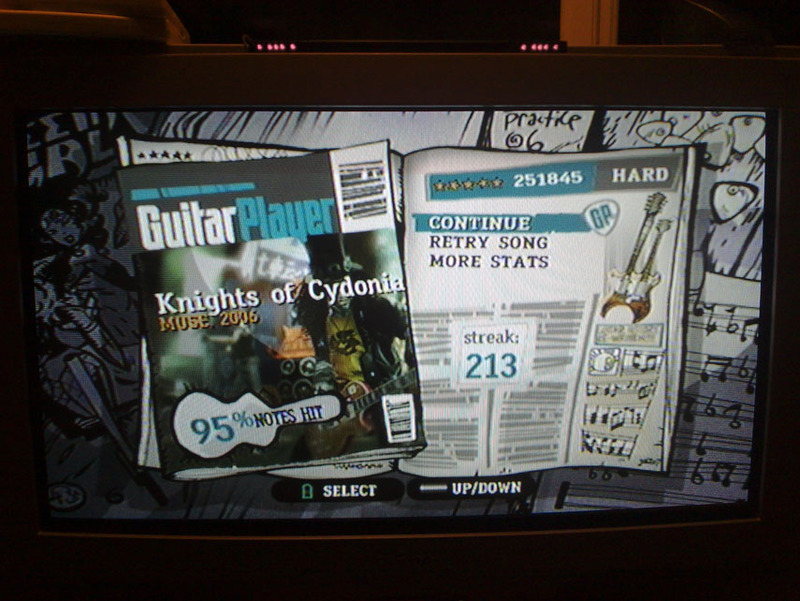 Still… a great game! I await the next one! Err.. hold on… I GAINED weight?! On top of all that, I cut my thumb on a shard of glass! I felt something on the sole of my shoe so I reached to pick it off and next thing I know I’ve got a piece of glass sticking out of me. It’s still tender now in fact! Still, jolly good fun had by all, but I think I’ll go back onto the lager next time!